These sheep come from the northern short tailed branch and have a bone structure similar to that of sheep found in Bronze Age Skara Brae – in fact, genotyping shows it is virtually unchanged from the original. Primitive and fine boned, the rams barely exceed 65 lbs. They have adapted to their island and have developed a grazing habit particularly suited to seashore land management – so specialized that they cannot be removed without the risk of copper poisoning. 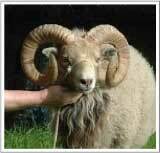 Both rams are horned and ewes may be horned, polled or scurred. The ewes are strongly maternal, lamb easily and frequently twin. The meat is delicately flavored. They are endangered with fewer than 500 breeding ewes remaining as of 2009. Wool of virtually any color can crop up – and the annual clip varies in average color from white through grey and oatmeal. Eventually the rams develop a mane of coarse hair as they age. It’s a relatively fine fleece, averaging 28 microns, but some kemp is present. Fleece weights average around 2# and the staple length is about 3”. It is warm and lofty – and frequently still suggests the smell of the sea.